Due to the aerodynamics of a Jeep®, wind and rain flows over the top of the vehicle and back inside the cab while driving without a top or with a Bimini style top. This “backdraft” can blow air, rain and items inside the Jeep forward creating a real mess. The MasterTop Zip Down Wind Stopper creates a barrier to this back draft keeping the inside cab dry and warm. Constructed of Durable OEM Approved Soft Top Fabric with an ultra-clear press polished window, the Wind Stopper is a must for those open air driving adventures. Each Wind Stopper easily attaches to the factory sport bar using heavy duty nylon straps and buckles. 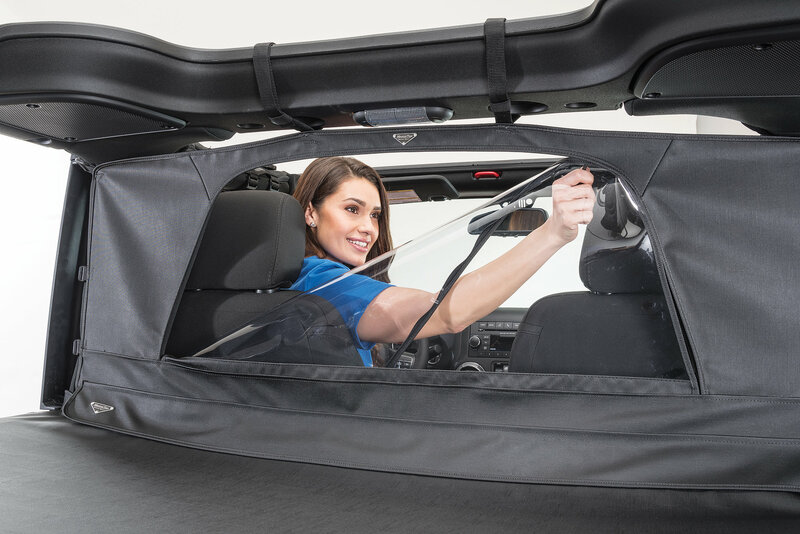 This ease of installation allows the Wind Stopper to be kept on the vehicle during the winter months keeping the warm air inside the front cab. This is the perfect all season accessory! Each MasterTop Wind Stopper features an exclusive zippered window for added airflow during those hot summer days. 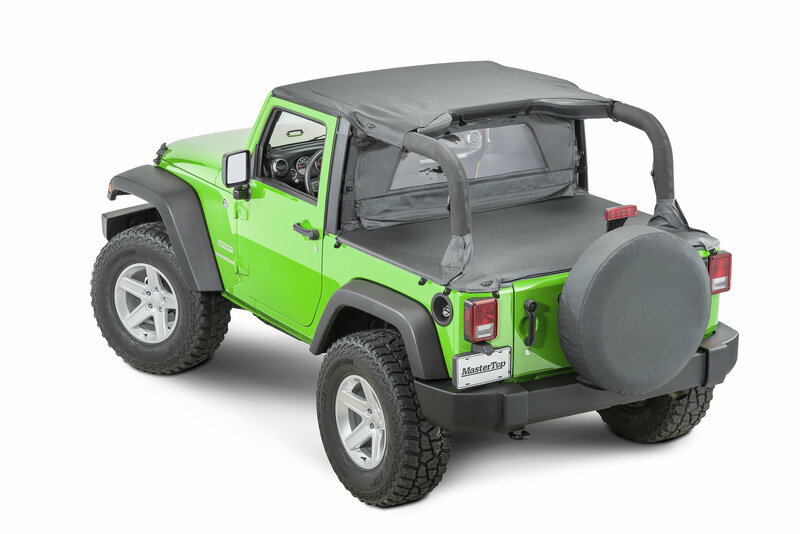 Only MasterTop Wind Stoppers feature a built in zippered rear flap that can easily be attached to a MasterTop Tonneau Cover for the ultimate summer soft top combination. All MasterTop Black Diamond Wind Stoppers use up-graded 28 oz Sail Cloth fabric for the ultimate in durability and great looks. This is a MasterTop exclusive feature found in no other aftermarket summer soft top! Great product and works as advertised! Awesome products !!! The windjammer and tonneau cover are perfect for long trips , just used mine for my trip to Colorado, the windjammer saved the day driving through the horrible state of Kansas when it was 114 degrees !! . On the way back from Colorado we stopped at golden where they are made ! I bought this as part of the MasterTop summer combo and it's pretty amazing! You do need to be comfortable sitting pretty straight up, because there isn't a lot of room to lean your seat back once installed. I'm 5'8" and don't have any issues. The zip down window is a great feature. Expect to have a gap of about 2-3 inches from the speaker bar to the top of the windjammer. Not an issue for me as I expect to run this top only during summer months in New Mexico and I've got the Bimini Top Plus and Tonneau cover so, I'm pretty well protected. I reviewed the other products that came with this as well. Check out the pics to see how it looks installed.